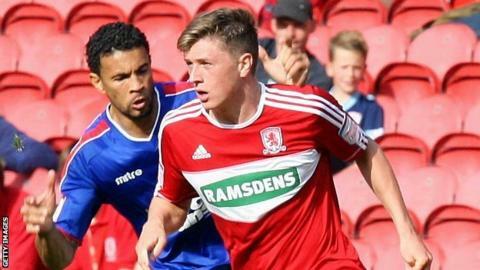 Academy product Adam Reach has signed a new four-year contract with Championship side Middlesbrough. The 19-year-old midfielder has been with Boro since leaving Gateshead College in July 2010 and has scored two goals in eight first-team games. "He's a young player who is progressing well and we're pleased he's committed his future," manager Tony Mowbray said. "He's done exceptionally well and deserves his contract. Hopefully we'll see him develop quickly from now on." Reach enjoyed a loan spell at Darlington last season where he played five matches, scoring once, and has since forced his way into the Boro squad with five appearances this term. "He's made an impact in the team this year and we're hoping he'll have a lot more exposure to the team as the season unfurls," Mowbray said.